There’s a new kid strutting around on the block. You know, the one who always had the latest trainers, newest toys, wanted to steal your girlfriend, aka ‘a cocky little fucker’. We all know one, right? Well, this new kid, is Inglorious. These young guns have been around for almost 2 yrs now (formed in Feb 2014). Fronted by the very hairy Nathan James (he has leant his considerable pipes to Trans Siberian Orchestra and Uli Jon Roth – just don’t mention The Voice!). He was on the look out for like-minded musicians that desired to make cracking rock music in a very honest fashion. He also wanted an ‘organic’ sound. You know, like in the good old days when albums were recorded ‘live’ and in studios as a group, and not just an mp3 file on an email being sent to opposite ends of the World. Because of this, the debut album is all about the feel, vibe, sound, energy and performance that a band can give you, with no auto-tune! 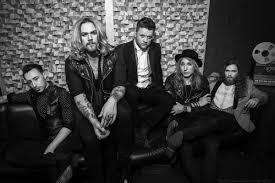 Like all good rock bands in the 21st Century, Inglorious have a Swede on board in Andreas Eriksson and is tuned in to the ‘classic rock’ vibe being targeted here. What I can definitely say, is that there’s a ‘Deep-Snake-Bow’ feeling to proceedings. If you grew up on the rock classics (Purple, Rainbow, Whitesnake), then you’ll get a lot out of this album. Opener ‘Until I Die’ makes straight for the Deep Purple tribute and the opening salvo is a different take on Highway Star – Hammond on full tilt, building to Couple this with some lung-busting vocals, expecting Gillan to burst in, only it’s a big dirty riff. James really goes for it and makes a huge difference to what could be just another rock band going thru the numbers. The voice is huge and he obviously doesn’t do things by halves!!! ‘Breakaway’ comes at you like a freight train whilst being tied to the tracks., a relentless song! It’s also a very Whitesnake (old and new) song, with nods to the classic Moody/Marsden and Aldrich/Beach styles. ‘High Flying Gypsy’ starts off a little drab, but has picked up pace by the bridge and chorus. So far so good! Holy Water takes its lead from a 70s classic rock sound – it particularly has the ingredients of Coverdale, Rodgers with a vibe that would fit comfortably with some of the aforementioned gents best works. ‘Warning’ explodes with James’ vocals (this bloke can rip 10 coats of paint from timber at 50 paces), especially the end bit. 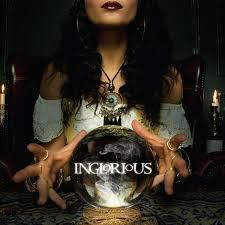 The overall interplay especially with Eriksson and Taylor gives Inglorious a huge, fat sound. ……my only gripe, and it is such a small one that I shouldn’t really mention it, is that James wants to sing at Max Power for every song. As someone once said, ‘if you’ve got it, flaunt it’, and James certainly has it to flaunt. Not every note has to have a load of welly behind it and I’d like to hear more variety. Small gripe, but that doesn’t stop the enjoyment to be had here. One of the definitions of Inglorious is ‘not famous or renowned’. Well give it a month or two and certainly amongst the rock community, they will certainly be ‘famous’. Well done fellas!